Wattisham is a fairly remote place, up in the hills beside a large airfield, which cuts it off from its nearest neighbours. It lost its parish church to redundancy back in the 1970s. I had only found this out when I tipped up in the churchyard on a day of rain in late 2001, so it was with some disappointment and even annoyance that I left the village and headed on in the direction of Buxhall. And then, I was surprised to find another graveyard on the edge of the sleepy village. This one was quite different. 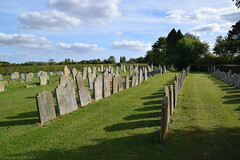 About 100 upright stones, all in neat rows across a clipped lawn. At first, I thought that it might be an overflow from the churchyard, but that was clearly not the case. An oddly shaped red brick building on the edge of the graveyard supplied the answer. 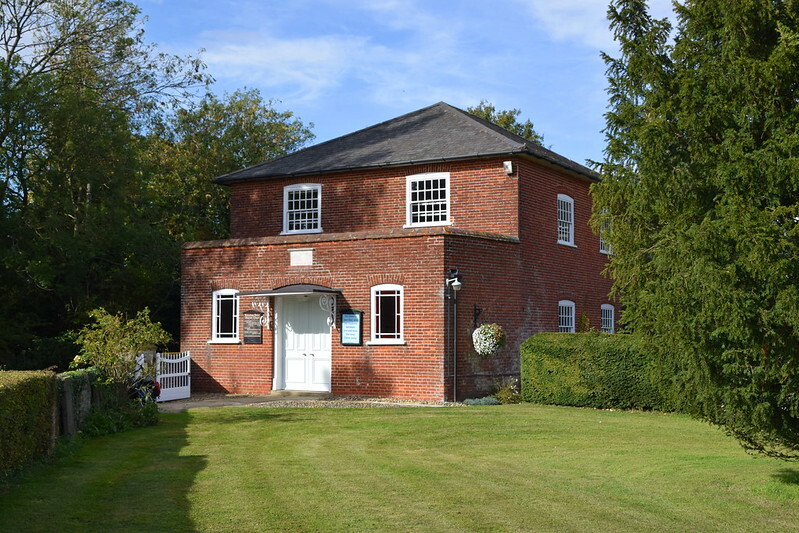 An early 19th Century structure, familiar from dozens of Suffolk villages, but with the oddity of a cambered red brick entrance porch, of the 1920s perhaps. 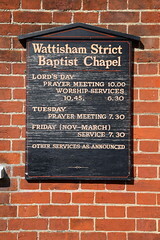 Wattisham Strict Baptist Chapel said the sign. The busy activities of the place were listed below. 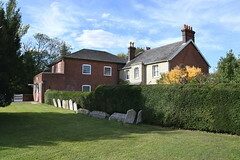 To the right of the chapel stood a pleasant 19th century villa in Woolpit brick, with the words The Manse on the gate. Rural Baptist churches are common enough in Suffolk. It would be true to call Suffolk a Baptist county in the way that some in the West Country are Methodist ones. The independent Congregationalist tradition has always been a strong one here. In Ipswich, there are probably as many Baptists these days as there are Anglicans, on the large housing estate where I work, there are three large, modern Baptist churches, while the local Anglicans have recently closed one of their two churches. Be that as it may, this pretty little corner seemed an incongruous find. For one moment, I might have imagined myself in rural County Antrim rather than anywhere in England. I thought that it would be interesting to take a look. I got off my bike, and went into the graveyard. But as I did so, it started to rain again. I tried the chapel door, not expecting it to open - but it did, and I stepped inside.I found myself in a light anteroom. There was a little bookstall, with newspapers and magazines, and a stairway led off to a gallery. Ahead of me, a simple doorway led into the chapel itself, and I went through it. I felt as if I had stepped out of time. I was in a superb early 19th century meeting house. The wooden gallery swept around on three sides, supported by cast iron pillars; there were contemporary benches beneath, all focused on the reading podium at the far end. Everything was well-kept, finely polished, and that was what made it strange, I thought to myself. Where is the dust and decay, the neglect I associate with church interiors of this time? This place felt as if it had been cared for constantly over the decades. I sat for a while in silence, and then wandered about. There was a highly polished parquet floor, and memorials to former ministers around the walls. Immediately in front of the podium was a modern light wood table and chairs - for communion, I assume. I wondered if there was a total immersion font in the space below. Outside the clear windows, the rain had stopped, and the sun sent shadows of branches scurrying across the woodwork. I wandered back into the anteroom. I took a closer look at the bookstall, and discovered that Wattisham Chapel was a member of the Grace Baptist Association - or at least, there was a pile of GBA directories, and I found this church inside it. There was also a pile of a newspaper called The Burning Bush - a protestant witness in a day of apostasy, published by Kilskeery Free Presbyterian Church, Omagh in County Tyrone. I glanced carelessly at the opening sentence of the main article: Tony Blair is the product of ecumenical religion. He is said to carry a copy of the Koran in his pocket and frequently peruses it. Well, as you can imagine, I was hooked. This particular edition of the newspaper was for October, and the whole of it was taken up by responses to the previous month's attacks on the World Trade Centre and the Pentagon. Basically, it argued that, as well as targeting Osama Bin Laden, the western industrial military complex should also go after Sinn Fein. Whether it was actually advocating the carpet bombing of republican west Belfast, I wasn't clear. I read on, fascinated. Such terrible events as those witnessed on Tuesday past are not a matter of injustice to the victims but of mercy granted to the living, it said. There is not one of us who dies in what are termed "tragedies" but deserves to! There is not one who escapes while others perish who deserves to! All of us are worthy of death and we can escape only by repenting and turning to Christ for mercy and forgiveness. Wow. I turned to the back page. One of the most horrific incidents... was watching as poor people, demented by the heat and flames behind them, hurled themselves into space in order to escape those flames. Of course, there was no escape for them in such action. But tonight, there is escape from everlasting hell for you if you but take one step, the step of faith, and come to Christ. Well, they certainly weren't pulling any punches. I leafed back through the paper. The gross hypocrisy of Blair and the British Government cries out to heaven for God's judgement. It won't be long in coming. Slightly stunned, I stepped out into the clear daylight. I wandered among the graves, most of the old ones indecipherable now. "Are you looking for someone?" said a voice behind me. I turned to face a formidable old lady who had followed me into the graveyard. "It's just that lots of people come to the graves looking for someone, and we have all the records here." It turned out that she was Mrs Hawkins, the Pastor's wife, and when I explained my interest, she told me something of the history of the place. Originally, 18th century non-conformists from the local villages had walked the fifteen-odd miles to Woolverstone every Sunday. I imagined them, farm labourers mainly, with their decent wives and poor children. They must have thought it revolutionary to find a way to God without the need to go through Parson and Squire first. "They went to Woolverstone because the preaching there was first class", Mrs Hawkins told me, as if it was something that had happened last week. "But in the end they found a man in their midst who could preach to them, and they gathered around him here." The preacher was everything. His name was John Hitchcock. 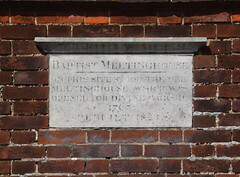 In 1889, an article in the East Anglian Daily Times recalled the setting up of Suffolk's first Baptist congregations, and noted that, within two years of joining the Baptist church at Bildeston, John Hitchcock,with a minority of the other members, resigned from it over the question of free communion. This small group joined Woolverstone Baptist church in the same year (1759), a step which demanded of them a journey of fifteen miles there and back every Sunday. They sustained this for nearly four years, until on March 9th 1763, the group, now numbering 28, was dismissed from Woolverstone with the mission to set up a Church in its own neighbourhood. 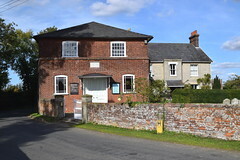 In the years of attendance at Woolverstone, John Hitchcock had become their spiritual leader, and in the autumn of 1763 he was solemnly set over them as their honorary pastor. He was just 30 years old. Hitchcock led them to build their first chapel on the current site. In the 1840s, it was replaced by the current building. "We still have all the records", said Mrs Hawkins. "We still do things the same way now as we did then. We still believe exactly the same things, and sing the same hymns. We're very traditional. We still wear hats." She was forthright, and a bit formidable, but utterly compelling. Drawn by her honesty, I asked a question I rarely feel brave enough to ask people at churches. Exactly how many people were in the congregation here? "We get sixty or seventy", she replied. "It goes up and down. People come because they like what they hear. Sometimes they hear something they don't like, and they stop coming. That's up to them. There are always others who come to take their place." I told her that I'd noticed that St Nicholas was now closed. Did the villagers treat the Baptist chapel as if it was now their parish church? She shook her head vigorously. "No, they'd never do that. There's the history, you see. The Anglicans and us. No, we're a gathered congregation. People come here because of what we preach." Had her husband been here long? I wondered. He had been Pastor for 37 years, she told me. He was chosen by the people, and if they didn't like what he preached they could throw him out. "But they never have", she smiled. She talked about the Baptist tradition in Suffolk, mentioning 17th and 18th century names that meant nothing to me. "We're the same now as we were then", she said. "We're still true separatists." Separatists. I caught on the word, and mentioned the Brethren community on the east side of Ipswich, where I live. "Yes, that's right", she enthused. "They practice Believers' Baptism and preach the Bible. They're like us." She paused. And then she said something quite extraordinary. "We're truly ecumenical", she said. "We'll stand firmly alongside anyone who believes the same as us." We said our farewells, and she invited me to visit them one Sunday morning. This is the kind of invitation that I often receive, but she made it sound as if it would be in my interests rather than theirs. I hadn't told her that I was a Catholic, of course, but I don't suppose that it would have made much difference. From the Strict Baptist point of view, we are all drowning or we are saved. There isn't much point in distinguishing the drowning from each other, Catholics from Anglicans, Pagans from Atheists. That was seventeen years ago. Coming back in 2018, a small part of me (well, quite a large part, really) wondered if I would find the chapel closed, maybe converted into a private house, perhaps a holiday home for north Londoners. But there was no great difference. Still the signboard with its service times, the neatly clipped lawn, the manse. 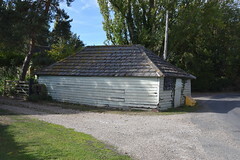 One addition was that beside the old stables across the road was a newly built car park for, I suppose, some thirty cars. 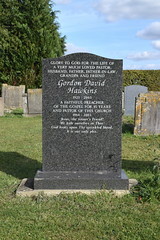 I went for a wander in the graveyard, and almost at once found the headstone to Gordon Hawkins, the man who'd been minister at the time of my first visit, and whose wife I had spoken to. He'd died in 2003. 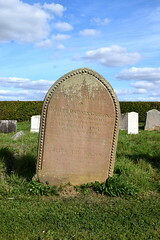 There was space on the headstone for his wife, but I must confess it pleased me to notice that she had not yet been added to it, but was still being formidable somewhere. I rather hoped that the current inhabitants of the manse might see me wandering and come out and chat, but it was not to be. Since you are probably wondering, I must tell you that this time I did not try the door to the chapel. I don't really know why I didn't. Perhaps it would have been open, perhaps not. If it had been so, and I had stepped inside, it would have been like stepping back across seventeen years of my life, seventeen years of all our lives. I couldn't bring myself to do it. Sitting here the same evening in the middle of Ipswich, I regret not doing so. Obviously, I wish that I had. As a Catholic, there is much in Baptist theology that I find very difficult, if not wholly alien. It seems a hard lesson - too harsh to sustain me, I think. I need enfolding in the healing arms of sacramental love. But you can't help admiring communities like this, what they have done, and what they are doing now, separated, in our midst.